Done. And it's going to take a while before my eyes can do a black airplane again. Most airplanes take me about 35 hours to do. This one clocked in at over a 100. That's a long time to be drawing an airplane, don't you think? You probably don't want to hear my struggles trying to get this beast to look as it should! However, recognize that "black" is a color that doesn't trifle with aspects of Light or Texture. It seems as if black's defining attribute is to blend-in rather than stand-out. But, here it is, the PBM-3 "Mariner" that Cass Phillips flew as part of VPB-20 based in the Philippine Islands, circa late 1944. 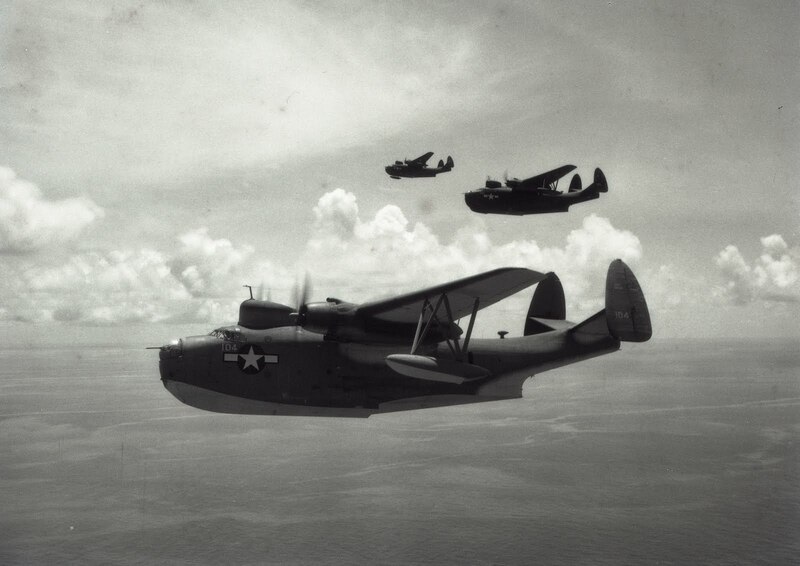 PBM-3's in formation, courtesy Cass Phillips. For aviation buffs, the PBM doesn't come to mind as a WWII Navy bomber—history tends to remember the airplane as somewhat of a rescue, supply or gigantic liaison craft. Indeed, the Mariner served in all those functions. However, it was, first and foremost, a war machine. Don't expect any photos of PBM formations, high over a target, unleashing a stick of HE onto factories or armored columns. Instead, the PBM was used more as a search-and-destroy weapon. In the case of Cass's squadron, VPB-20, the missions were characterized by hunting low and slow along coastline and river estuaries, looking for hidden Japanese freighters or patrol boats. 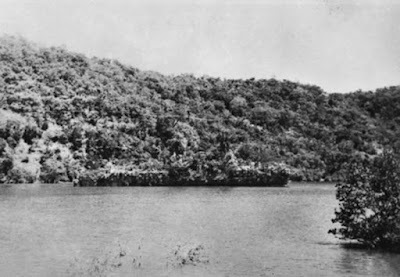 Supposedly, this is a camouflaged Japanese ship somewhere in the S. Pacific. Any clue? 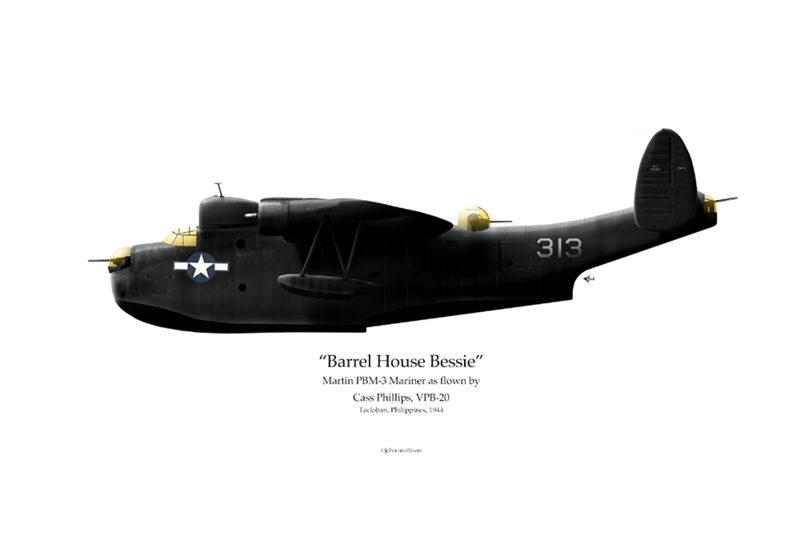 ...however, have another look at "Barrel House Bessie" (Cass named her). Typically, PBMs were painted in the Navy's "tri-color" scheme of gray-blue, lighter gray-blue and white. Obviously, that isn't the case here. 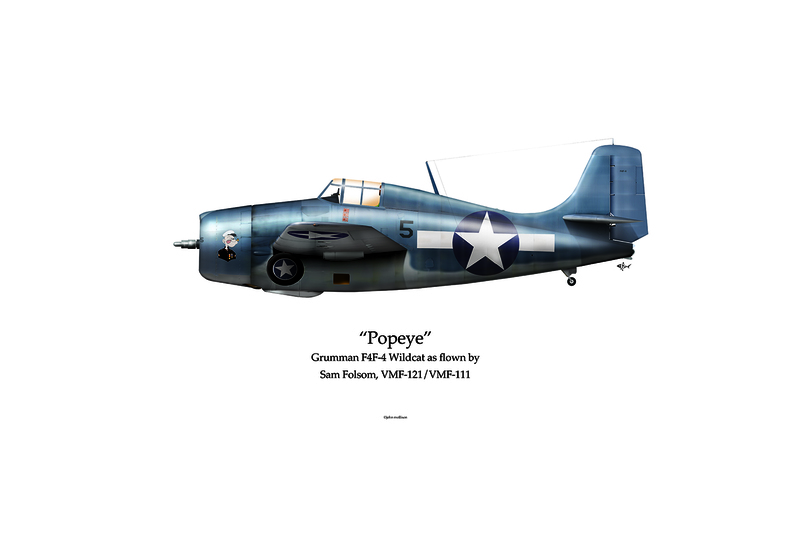 Some time in the Fall of 1944, the Navy gave the airplane a new coat of paint. "All black?!" he remembered. "They painted my airplane all black! And of course, you know why they did that, don't you?" Cass's PBM-3D, BuNo: 45313. It appears here in its tri-color paint scheme. When it was painted all-black in late 1944, Cass couldn't remember if the "313" was painted over or not. He and I discussed it and elected to keep it on the black version. "That's right! We needed it to fly at night!" Think about it—by late 1944, the Japanese were so on-the-run, the only place left to hide was in the dark. So, night-time became the time when the Japanese felt safest moving about. Warfare, of course (at least if it's 'done right') is not a 9-5 job. Well, it is...but for VPB, it meant 9pm to 5am! 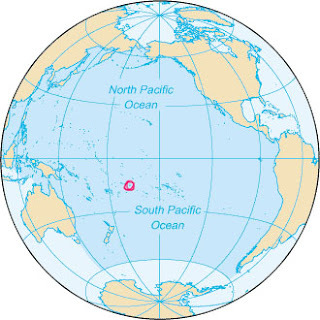 Based at Tacloban, Philippines, a VPB-20 mission would begin at sunset. One can imagine the howl of the engines, the percussive banging of waves, the steady of roar of water-on-aluminum and then, at the moment of flight, a sudden smoothening, replaced with the hypnotic rumble of 3200hp droning overhead. Cass and Crew of "Barrel House Bessie", circa 1944. "We'd get up and go around the (Philippine) islands." Cass explains. "We'd be out looking for the little ships—supply, troops—and when we found them, we'd flip on the spotlight and start shooting! We'd make our first pass (with guns) and then I'd turn back around and then we'd bomb." "And I'm assuming the Japanese kept their lights off, right?" "So how did you spot the ships?!" "Well (clears his throat), that'd be where we used radar. See, we had a radar man aboard. The old radar, the kind we used in PBY's up in the Aleutians, that wasn't as good as the radar we had (in the Philippines). 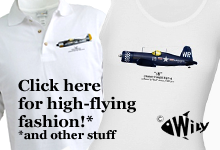 We'd fly along the coast lines until the guy would identify a target and we'd hit it." "What did a ship look like (on radar)?" "(A typical radar picture) was a line, a line that simulated the coast. That's what we'd see. 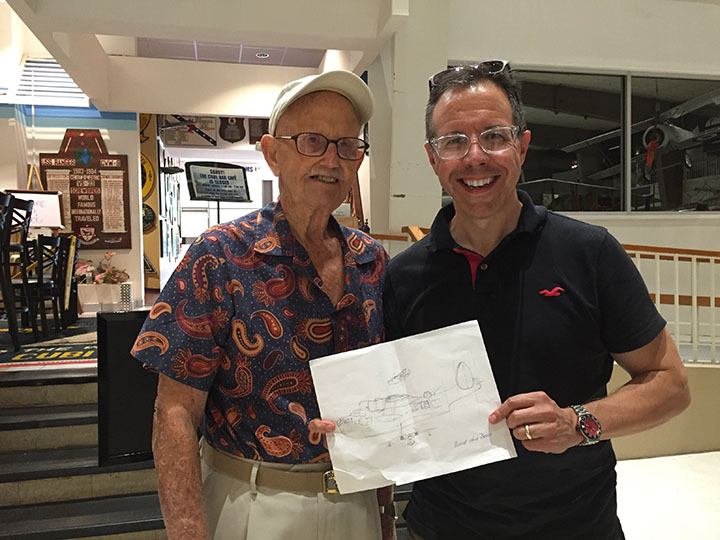 And our radar operator would be able to tell if anything stood out along that coast." Bear in mind, those early radar scopes weren't anywhere as clear as the ones in use today. A few years ago, I saw a demonstration of what WWII-era radar screens looked like and was surprised at how crudely they displayed. They looked more like Rorschach test graphics instead of anything resembling reality. In today's instant-evolution of technology, it's easy to forget the often exhausting process that brings us to where we're at. "That had to be an art to learn how to read those things. A skill almost..."
"It most certainly was! It was something you had to learn. By experience." 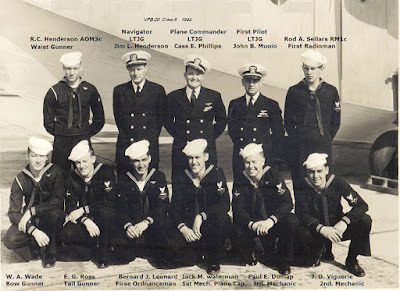 I can only imagine what it must have been like to be up there in the dark, looking for targets—their sorties certainly inspired the nickname of "Nightmare" given to the mission of the all-black PBMs. But I'm not quite sure who had the nightmare, the Japanese or the PBM's crew. "So you'd take off at night and come back, when?" "We'd fly all night. We'd get back around sunrise." Though every job has its challenges, to me, the hours of instrument-flying in a black-out sdenvironment, searching for those fabled "seconds of terror" are especially awe-inspiring. Have a look at the photo below—it's a picture I took of Cass's logbook. 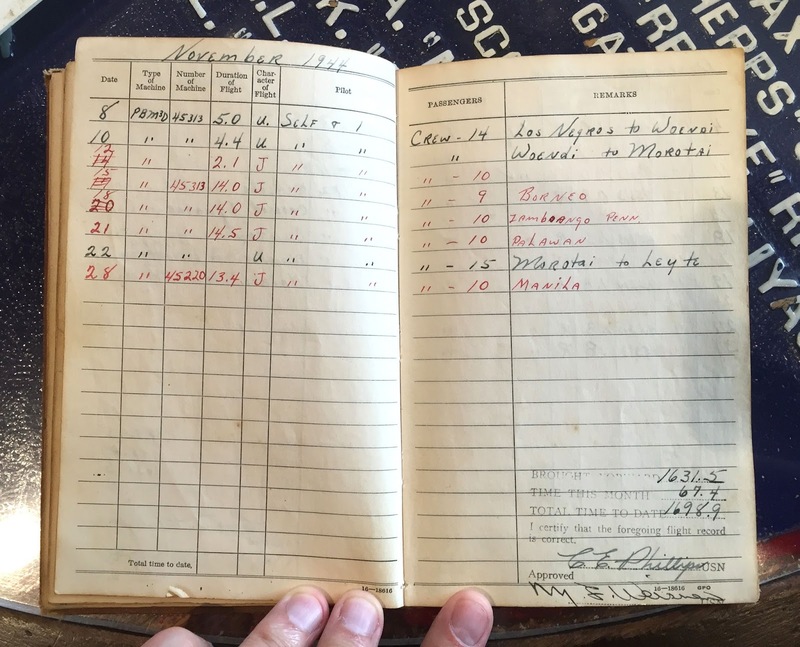 Cass Phillips logbook, VPB-20. 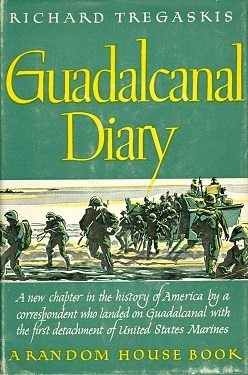 The page is turned to November 1944. Check it out yourself—a crew of nine or ten, aloft for fourteen hours on three dates, thirteen hours on another. That's some serious time aloft! In comparison, a B-17 mission in the ETO was long at 8 hours. But then again, Cass's 95 years comprise some serious time alive. You know, if I had a dollar for every time I was asked the question, "When is your book going to be ready?" I'd be really wealthy. My answer is the same—I don't know. This all takes time. Though I really enjoy the tech and data, my real passion is for the bigger-picture story and that, as Cass knows, doesn't just happen. I can promise this much—when I get my book ready, Cass will be in it, no doubt. In the meantime, I hope you can spare a couple minutes to listen to his thoughts on what he's learned over so long. Come to think of it, I shouldn't complain about how long it took to get Cass's airplane done. He let me know he was glad I put the time in it to get it right. VPB-20 bomber pilot Cass Phillips on "ageing." from John Mollison on Vimeo. Cass Phillips, VPB-20 and Me. 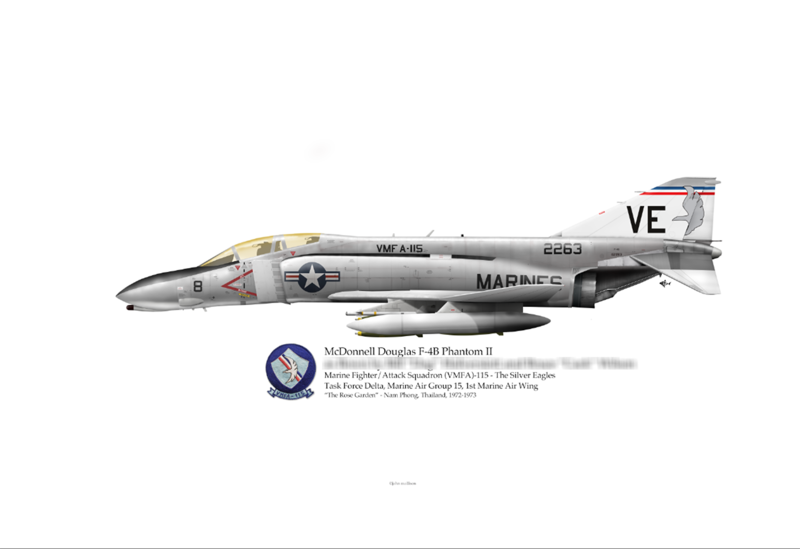 Have a look at the F-4 above; it's a B-model that flew close-air-support for the Marines during the Vietnam War. A few of the details are worth noting—for one, it's a VMFA-115 plane. The stylized "silver eagle" on the tail illustrates just one of the squadron's unusually diverse variations in markings. For two, the nose is a tri-color, incorporating the black anti-glare panel, white underbelly and gray sides (usually it's all-white or all-black). But, the third detail is hard to read and I'm not referring to the blurred-out the name of the crew. For now, the pilot's name and record will remain incognito. 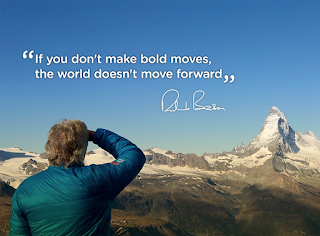 Instead, see if you can read the last-line of copy. I'll spare you the squinting: it reads, "The Rose Garden, Nam Phong, Thailand, 1972-1973." Though I'd heard of Nam Phong, I'd never heard of any place in SEA with such a lovely name. “What’s that about?” I asked the pilot. “Yeah. Maybe.” Truthfully, I was all-to-familiar with the song. The only thing I loath more than "Country" is the phenomena called Earworm. Growing up in the Dakotas, and being that Lynn Anderson was a native daughter, I'd been infected at birth. "You've got to hear it!" he exclaimed. Whoosh! In the glory of the internet, I got an email; he gifted me the Earworm song. Great. Just great. It'll take me three more weeks to clean the thing out of my head. But in this case, that's part of the point. 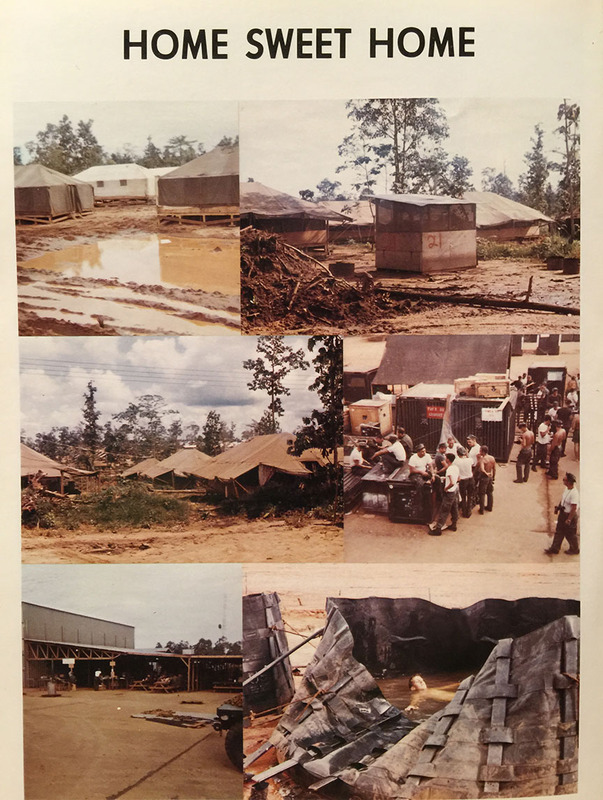 While the Air Force had, "Hot and cold running girls and beer" at their bases, the Marines had something more "earthy." He also sent a picture. and if you know who, I'd love to give credit. Bear in mind, of the little I know about the aerial portion of the Vietnam War, 70% of it has to do with Air Force (as opposed to Navy, Marine, Army or NVAF ops). “Yeah. We had tents and C-rats*. 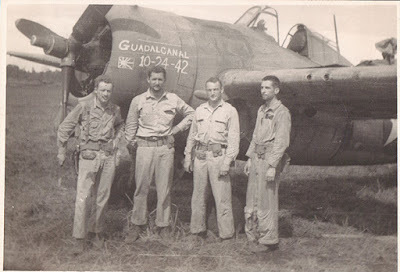 The Air Force guys in Udorn** had air conditioning and nice restaurants." In a pathetic effort to relate, I tried to find common ground. "It looks like a lousy Boy Scout camp." "Naw. It's a Marine thing; more bang for the buck. You know the old adage, ''we never promised you a rose garden!" It must be a "Marine Thing" as they made it part of their recruiting efforts, too. You know, the Air Force guys have probably long- forgot their cold beer and cool dorms but to the Marines who flew from the grime-crusted, bug filled and mildew-scented tents of their “Rose Garden” base, the humble circumstances are a proud memory. From photographer and Rose Garden alumnus, Robert D. Young. He let me know that at one time, he had many more photos of the place but the heat and humidity got to them. Thankfully, he didn't let the discouragement get to him; he's still taking pictures. *About those "C-rats." 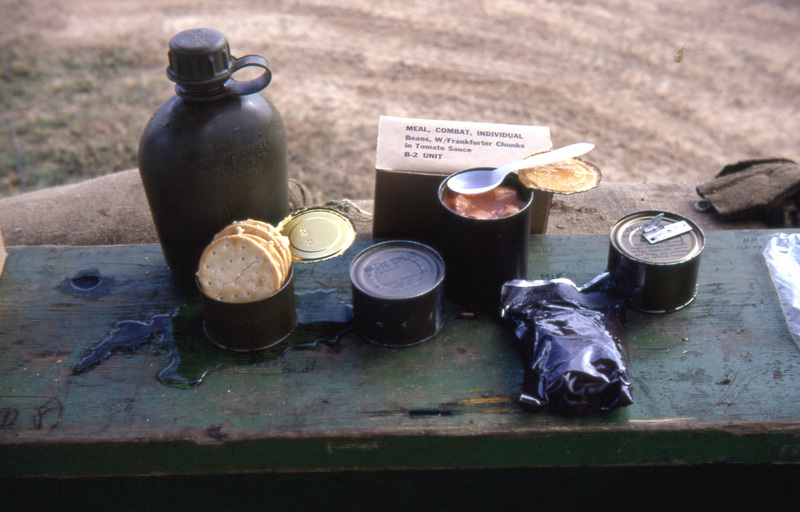 The photo below is from a Marine airman circa 1967. Based on what I've learned from other Marines, I'd guess they hadn't changed in 1972. **Udorn was a well-used USAF base during the war. Click here. "If all of your heroes die, you have no more heroes." Have a look at the MiGs above and below—they're ex-NVAF birds flown by two of North Vietnam's ranking heroes of the Vietnam War. 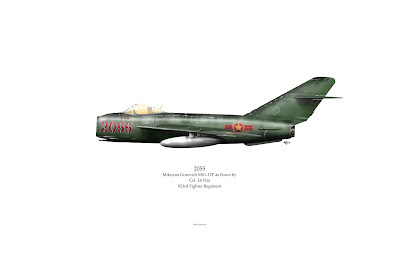 The silver one was flown by Nguyen Van Bay (7 victories) while the green one was flown by Le Hai (6 victories). I drew them last year to present to the pilots as gifts. Though I've met a few NVAF pilots before, these two were especially interesting in that they flew this almost-obsolete jet in combat against the American state-of-the-art. They did pretty well, too—between the two of them, their aerial claims account for almost 50% of the type's victories during the entire Vietnam War. Judging by website stats and emails I receive, the Vietnam War is coming into a new vogue and predictably, the audience is half the age of those who served. 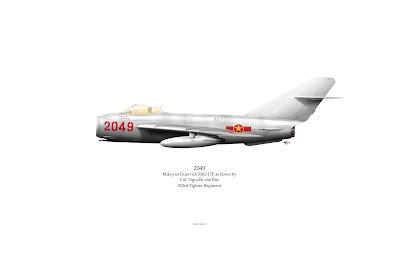 Of course, that makes sense as the days when MiG-17s were scrambled to meet American iron were two generations ago. As in, 1966. And, since 1966, the world's population has more than doubled. Today, it's around 7.5bn. Back then, it was 3.3bn. Put another way, statistically, there's a whole new "1966 world" that has come to life after the fact. 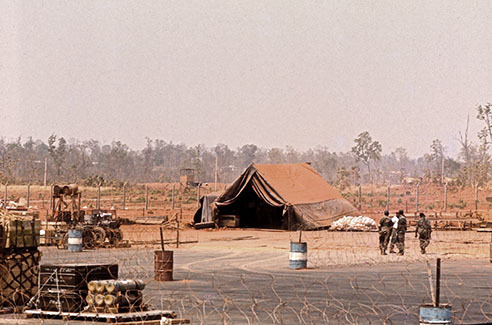 Put another way, pretty soon, the Vietnam War is going to be utterly absorbed in time. Ok. So here's the scene: ex-POW Capt. Charlie Plumb and I are on a bumpy bus heading west from Ho Chi Minh City (formerly Saigon). We're in the front bench seat while behind us, two ex-NVAF fighter pilots are flanking our translator. I'm cranked around getting my palm read by one of the pilots, Tu De De. He's making a big show of it and then announces that, though I was an 'intellectual,' I was probably impotent. (Half right, take your pick). He then looks over at Charlie, smiles and makes a kind-of-bow. Prior to my "reading" (more like a curse), he'd read Charlie's palm and proclaimed him strong, handsome and virile. It would have been a whole lot more awkward if it hadn't been so damn funny! Then again, it wasn't the first time a writer got dissed in a crowd of warriors. In hindsight, I have a million awesome comebacks but that's the problem when you're an intellectual—it takes so long... (drum roll, rim shot). Photo from Dr. Sy Hung's "Red Book"
Anyway, the other pilot was General Le Hai. He'd been following the banter with sideways glances; I wasn't quite sure if he was amused or not, but I've come to expect such that from Generals* as they tend to have mastered the art of keeping a diplomatic distance. Tu De was, on the other hand, a Colonel and therefore capable of providing comic relief (at least I hope that's all it was). Eager to change the subject, I started asking questions of Tu De, who seemed to like the attention. Our translator was especially quick and the conversation flowed easily. I learned a ton about the air war that took place post-American involvement, circa 1973-75. There's so much more to that story, it deserves a book so I'll leave it at that. 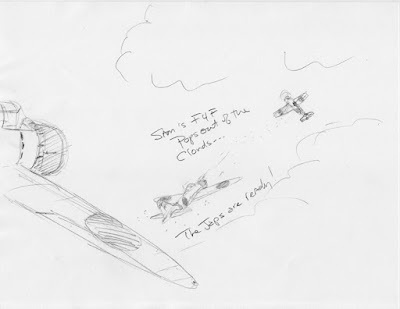 However, when it came to, "So did you claim any aerial victories?" our translator stopped and waved his hand as if to say, "No." No as in "No victories" or No as in "Don't ask this"? "I will not ask the question," said the translator. "It is (pause for the correct word) impolite." "It is, respect. For the General." Tu De and Le Hai were following the translation with interest, though I wasn't quite sure how much they were picking up. But, being an intellectual (ha ha) I figured that somehow, the Asian concept of Saving Face was coming to light. On the other hand, being impotent, I figured I had nothing to lose by pressing the issue. "Ok, just one more question - did Tu De score more than General Hai?" 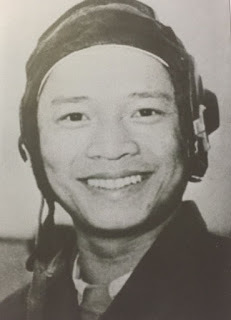 General Le Hai, Capt. Charlie Plumb, Nguyen Van Bay at Van Bay's farm. Fast forward—it's night time and we'd just spent the day at Nguyen Van Bay's farm (awe-some!). Tu De and Le Hai were in another car and Van Bay had hitched a ride with us back to Saigon (Ho Chi Minh City). It was late, we were exhausted and no one was particularly enjoying the 2.5 hour bus ride in pitch black rural Vietnam. However, unencumbered by protocols, Van Bay was proving to be an excellent conversationalist. I couldn't quite determine whether Van Bay was the prototypical Party Ideal (he even looks like Ho Chi Minh!) or rugged individualist (going from fighter pilot to farmer?!) but his story was compelling. 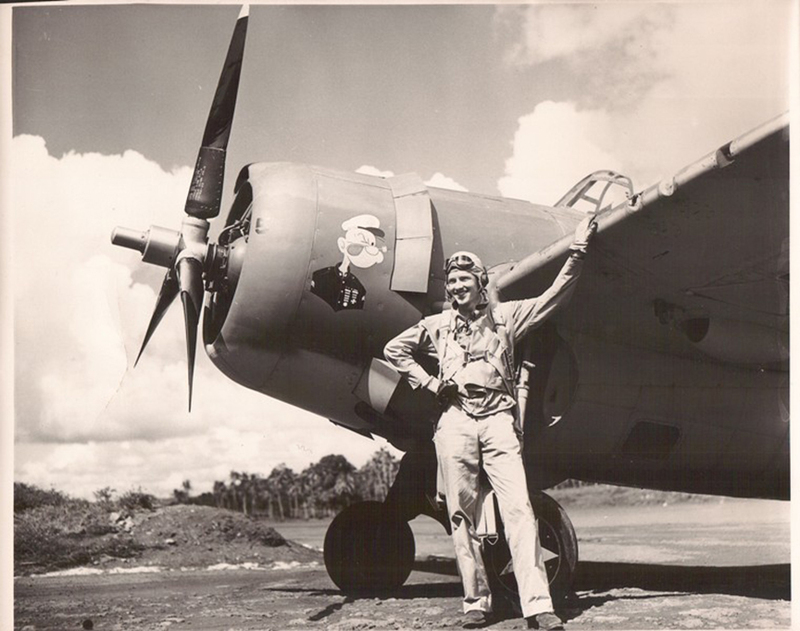 Armed with a 3rd grade education and a childhood of comparative poverty, Van Bay rose to the rank of fighter pilot with the native instinct of a bird. 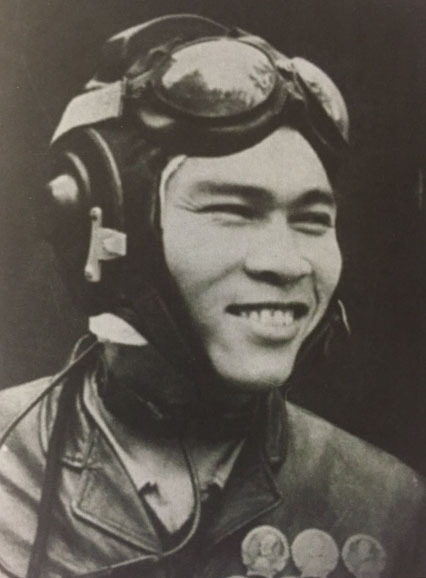 Here's the kicker; out of thirteen sorties** (making contact with American aircraft) he scored on seven, achieving a victory each time he fired his guns. Ho Chi Minh himself grounded Van Bay on account of the pilot's hero-factor. Anyway, up until this point, we'd talked more about tactics, weapons, history and what it was like to be a fighter pilot with a 3rd grade education. It was Van Bay who shifted the tone of conversation. "One of (your generals) said that you would bomb us into the stone age, correct?" "That'd be General LeMay. Yeah, he's supposed to have said that." "It was true, I didn't even have a stone bowl!" (he laughed). Nguyen Van Bay circa 1967. It seemed a good time to now ask the question everyone asks me to ask them, "So what did you think of (Americans) during the war?" His reply was quick. "Whoever hates me is my enemy." He then looked away, thought for a bit and added, "(But) no one won (the war). We were (both) unlucky that it happened. Now, I am happy that I don't have to fight. We can be colleagues." He nodded at our translator, Captain Plumb and myself, punctuating the gesture with an authentic, beaming smile. It was the perfect time to move the conversation away from the past and onto something brighter. Grandkids, his farm, maybe bottling his homemade hootch***... "So what do you want to do with the rest of your life?" Upon the translator's restating, the smile receded. Van Bay paused momentarily, and if my memory serves me right, took another look out into the black. "Now? I will tell you. I want to go to America and meet the families of those that I killed. I (can) never say I'm sorry. But, I want to give them my respect." Hmmmm. There's another story there but I'm not sure how to proceed. Wish me luck. Back to the quote at the beginning of this post - "If all of your heroes die, you have no more heroes." —that came from General Le Hai. He seemed especially eager to say it, nodding at Captain Plumb, then my pen and notebook. I remember the General affectionately patting our translator's arm, too. So, I dedicate this post to our translator—a Vietnamese intellectual himself, father of two and as honored to spend time with his country's heroes as I am my own. I hope he and I are smart enough to keep them alive, too. And in response to Le Hai's quote, I totally agree. If the memories of our heroes die, future generations have nothing to go on other than superstitious guesswork. PS - Why "Snakes"? It was a derisive nickname given to the little MiGs on account of their manueverability, ground-hugging tactics and sometimes snake-colored camouflage. OH YEAH! 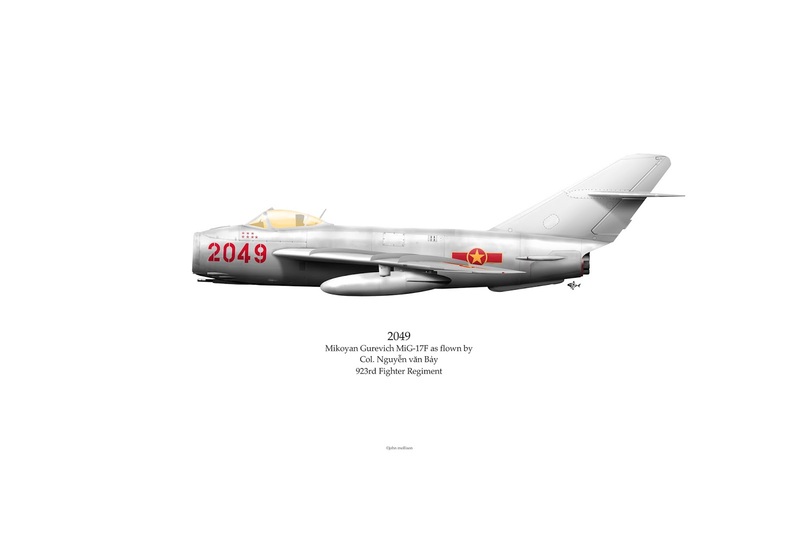 If you'd like to build your own MiG-17 in Van Bay's markings, click here. 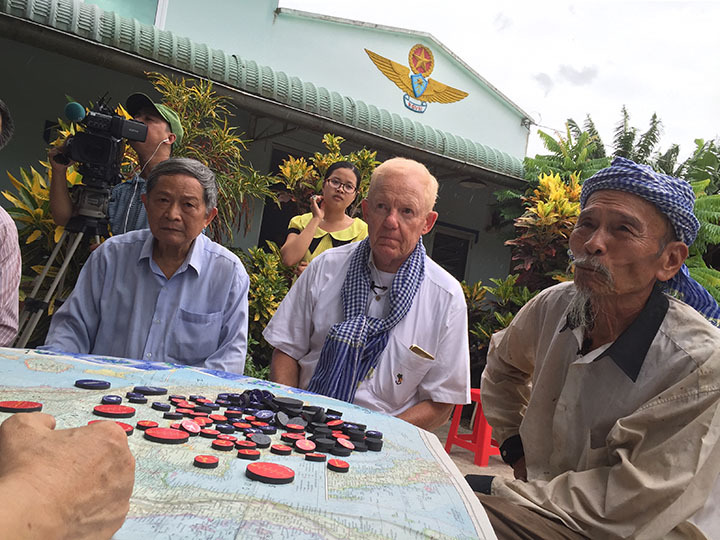 Bus ride with ex-NVAF fighter pilot Nguyen Van Bay from John Mollison on Vimeo. *Le Hai worked his way up the ranks. **13 seems like a low number but it bears out considering the frugality and absolute authority of the NVAF's "Ground Control" mode of operations. As for scoring every time he fired, Van Bay expressed the dicta of so many WWI and WWII aces of maneuvering to fire at the closest possible range. 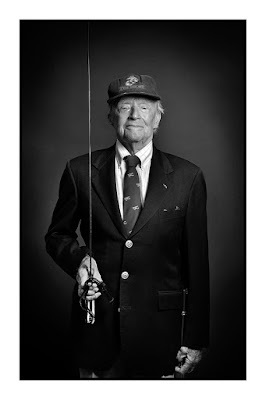 He told me that they were taught to be, in his words, "...close enough to touch the enemy's belt." ***Actually, pretty good. It was tart, sweet and thick, if you're a fan of Sour Patch Kid candy, imagine them liquified and tinged with Rum. To own prints of either MiG, signed by their pilots, click here. UPDATE - OFF. THE. CHART. Interest in these MiGs has been huge...and though this post is actually a few posts "down" from the opening post, it's the #1 'click.' Readers have been weighing in to varying degrees and one has sent pictures of a MiG-17 model that he built. It's really a remarkable model in that he's captured the crude paint scheme as it's been described to me.